Why is Special Assistant to the President and First Daughter Ivanka Trump consorting with Jamie Gorelick, a moldy barnacle of both the Clinton and Obama administrations? Last week, when stories about Ivanka Trump’s new status as an official White House employee surfaced, so did a dreadful name from the past: Jamie Gorelick, who is now serving as Ivanka Trump’s ethics lawyer and adviser. If the name sounds familiar, it’s because Gorelick is a hack lawyer who’s been a regular fixture in the smoky back rooms of both the Clinton and Obama administrations. And she’s the extremely partisan figure who served on the 9/11 Commission despite being at least partly to blame for 9/11. You’ll recall that Gorelick was the Clinton Justice Department Deputy Attorney General who wrote the memo to top Clinton administration officials forbidding the sharing of information between the FBI and the CIA. The “Chinese Wall” she insisted on led to the inability of the FBI and CIA to communicate and share intelligence regarding several of the 9/11 hijackers–information that certainly would have led officials of both agencies to discover the 9/11 plot and perhaps thwart it. It also made it easier for the hijackers to enter America without anyone who vetted (such that there is any vetting beyond the usual five minutes spent on applications) having access to information regarding who these men actually were and what they were involved in. The “wall” was a stupid thing, but it’s the kind of wall uber-liberal witches and warlocks like Gorelick insist upon, jeopardizing (and, in that case, costing) the lives of Americans, while they oppose the only kinds of walls we need for national security–physical walls on our borders. Gorelick isn’t just a hack liberal partisan. She was a major donor and considered for top law enforcement posts during the Obama administration. Gorelick served on Barack Obama’s transition team. She donated over $10,000 to Obama’s Presidential campaigns. And Obama was seriously considering her for the position of FBI Director, despite the fact–again–that she created the silly “Chinese wall” that likely led to the 9/11 attacks’ successful perpetration. Then, there is Ms. Gorelick’s disastrous Clinton-era tenure on the board of the Federal National Mortgage Association a/k/a “Fannie Mae.” It’s Exhibit A of how so-called public service can become a get-rich-quick scheme if you know the right people. Bill Clinton appointed Gorelick Vice Chairman of Fannie Mae, where she served from 1997-2003, despite having zero experience in the financial industry. During her tenure and “leadership,” Fannie Mae lost an unaccounted-for $10 billion dollars. Yet, she was rewarded with a nearly-million-dollar bonus (after Fannie Mae falsified transactions to make it appear that targets had been met and exceeded) and earned over $26 million dollars. Twenty-six million dollars for six years “work,” zero experience, and a $10 billion loss? Nice work if you can get it. And you can only get that stuff if you’re one of the special few who’s connected to the establishment running Washington. Cha-ching. That’s on top of the fact that her law firm, WilmerHale, represented and continues to represent Gitmo terrorists and also the Saudi Royals in defense of lawsuits against them by 9/11 families. That’s a huge conflict of interest in and of itself, given that Donald Trump ran on keeping Guantanamo Bay open, and it wouldn’t hurt Gorelick’s firm if she whispered to Ivanka about maybe setting one of her firm’s clients free. Leading up to November 8, 2016, Gorelick was busy vetting Hillary Clinton’s future cabinet members. Oh, and don’t forget that Ms. Gorelick serves on the board of the mega-liberal Center for American Progress that opposes every measure President Trump is trying to implement. Make America Clinton Again? And now this woman is not only advising Ivanka Trump, but she’s also Ivanka hubby Jared Kushner’s lawyer, too. Is this really the woman we need advising America’s Republican First Family? Maybe because Jared and Ivanka are really liberals. No, not maybe. In fact. Oh, and how did the Trump daughter and son-in-law connect with Gorelick? Well, Jared Kushner’s brother, Josh Kushner, founded Oscar, a healthcare firm that was banking on the continuation of ObamaCare. He founded it with liberal former News Corp (parent company of FOX News) exec Joel Klein. Klein, a bigtime Dem, recommended Gorelick to Jared. And she’s been advising Ivanka’s hubby ever since, also as his ethics lawyer. 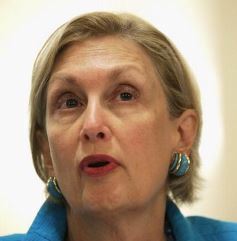 Jamie Gorelick is yet another blatant swamp thing who demonstrates that Donald Trump and company are not draining the swamp. They’re taking to it quite fondly. Remember that Ivanka Trump told Leslie Stahl on “60 Minutes” that she was not going to be a Presidential adviser and was just going to be a loyal daughter. That was bunk. But worse is that she and her husband have given entree to Obama and Clinton operatives like Gorelick in the Trump White House. It’s not a good look or a good mix. One other thing: Jamie Gorelick was rightly one of Rush Limbaugh’s favorite villains for years, as he repeatedly attacked her on his nationally-syndicated radio show. But now that Jamie Gorelick is a courtesan of Trumpdom, there’s not even the slightest peep out of him about her. Hmmmm . . . .
Spicer looks like he needs some kind of product from a pharmacy, . . .
having to do with intestinal discomfort. Maybe Gwyneth Paltrow has some products on her web site that’ll take care of that . . .
Gorelick now embedded in the WH? Koskinen still heading up the IRS? Not much “draining of the swamp” going on, is there? Its strange to me, why all these leaders want to test Trump? They didn’t test O and he was suppose to be the pushover? Why they all test Trump. We’re going to have to bomb N Korea. Yeah Brain we just need to drop a couple of those non nuclear bombs on Kim Jong Dung’s house. I think at least four should do it. Heh heh! Trumps best move yet was to drop that bomb . Shows Assad and Kim Dung “keep messing around if you want to, we have something for that was” because it looked like pure desert where they dropped it, it was to show the world, that Big stick Teddy talked about UH here it is..
Has anyone noticed that look of Jamie Gorelick in that pic, reminds me in particular of that faraway look that some nursing home patients have in their face, that sort of “out of it” vibe. And as to the Syria bombings, besides the issue of them ultimately serving to all but aid and abet ISIS, it’s also a spotlight on the dangers of basing foreign policy decisions on the “social workers’ ” mentality rather than what should be the guiding principles we had followed until LBJ in Vietnam (with his “win their hearts and minds” BS). What we also saw in Somalia under Bill Clinton. In a different vein, I’m getting somewhat worried. Debbie hasn’t posted an article in two weeks. I hope she’s not having any physical problems. Oh Bill you silver tongued playa what did you say next “Do fries come with that shake” “Uh do you have White in you? Black woman “No, why do you ask” Bill “Do you want some” lol he created a mess goofin’ on Maxine’s wig. Brown sugar, hot chocolate, personally I think both terms are vulgar and derogatory, but . . .
Yeah just like the song Brown Sugar by D’Angelo. I remember in middle school I called this cute girl White chocolate because I thought I had game for a 13 year old. I got shot down quickly because without missing a beat she hugged me and called me a brown colored milk dud. Now keep in mind we were both 13 and I grew out of calling girls weird names. O’Reilly on the other hand called them on the phone (O’Loofah) called them hot beverages and did other stuff. It was also reporter that’s one of the reasons Me-Again Kelly left to go be pals with light in the loafers Matt Liar and Co. That part by her could just be made up because we know how honest she’s been. Anyway it looks like its curtains for the O’Reilly Factor Host. All because he couldn’t help himself. But I agree, he has no game. Not that he ever did, just position and the “power” that goes with it. I used to cringe when he would make suggestive remarks toward Lis Wiehl on his radio show. He would do it constantly, stepping up the level of suggestiveness, to the point where I genuinely wondered about his character off mike. He had other sidekicks, but she was his main sidekick during his radio show. She’d tough it out with him, but it was his show, so the control of the tempo, banter, subject matter, etc., was always in his hands. I stopped watching him seven years ago, so if it’s true, good riddance, Uncle Bill. I was the first I know of to call him that, but he became quite the self aggrandizing schmuck, didn’t he?